Lifestyle Solutions catches Horse Fever! Lifestyle Solutions is very proud to be a sponsor of the 10 year anniversary of Horse Fever. 27 new horses were unveiled last night on the square in Ocala and taken to their new homes where they will be on display for the next 6 months. The Marion Cultural Alliance organized the event and all proceeds will benefit charity. 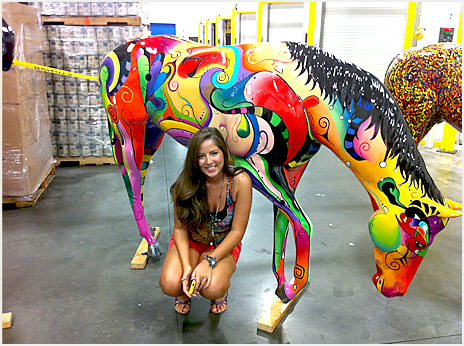 Lifestyle Solutions picked the horse named “Wild Abandon” designed and painted by Brynn Barnett, a local young artist that shows off a full array of colors and design patterns. It is truly a work of art. A proper “stable” display was prepared for the horse’s arrival and so we encourage all of our clients to come and see the newest addition. Lifestyle Solutions is a very proud sponsor of this project and very happy to be a part of something so inspiring in the community!